Pokemon Global Link / Dreamworld is Up! 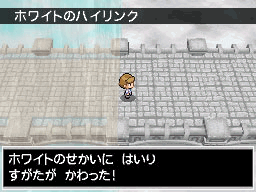 Pokemon Dream World was scheduled for lauch on March 30, 2011 but due to the current Tsunami/Nuclear Disaster in Japan (which appears to be the main hosting server for the site), it will not be launched until further notice. Hopefully the crisis in Japan will be resolved soon. Our hearts go out to them. Only 4 more days until our new journey begins..
Visit your friend’s Pokemon Black and White World! Anyways it warps the player to the “High Link” located in the center of the region where they can link up with other nearby friends, catch certain Pokemon only attainable in the “High Link Forest” and where you can even venture into other nearby player’s Unova regions! 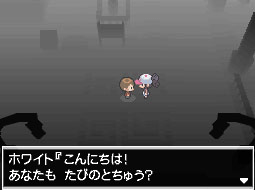 When visiting another player, you are shown using your multiplayer avatar in a monochrome version of Unova. You can also accept missions to complete together in your friend’s game world. You can team up with your friends to do these missions but some missions also require you to face up against your friends and battle. There are Item missions, Rescue Missions and (ofcorse) Battle Missions (Who dosn’t want to become a Pokemon Trainer Hitman??). This is as close to a Pokemon based Nintendo MMO as we’re probably gonna get for now so enjoy it! Pokemon Black and White was released in Japan on September 18, 2010 and is expected to be released in North America in early Spring 2011. Pokemon Black and White gets Facetime! To further “Americanize” the game it seems everyone gets..
a free Apple iPhone with Facetime!!! The Facetime key item is known as the “Live Caster” which works with your C-Gear (the latest in Poketch technology) to let up to 4 players video conference online (if they have a Nintendo DSi or DSi-XL and the camera function is not disabled). Presumably, players are allowed to just voice chat as well (for those of us who have yet to upgrade our older generation DS). The new C-gear also has an Infrared option that allows players to quickly trade friend codes without the hassle of having to type in everyone else’s 10-digit friend code. There’s also a warp option (sure, why not?) to the High Link area where you can visit your friend’s game worlds. There are a couple extra features but we’ll find out more about those later. Pokemon Black and White takes place in New York! So as we all know, every Pokemon game’s region draws inspiration from a real life area of japan. Red and Blue’s Kanto Region is based on and named after the real Kanto Region. Gold/Silver’s Johto is modeled after the Kansai Region. Ruby/Sapphire’s Hoenn is an angled version of Japan’s island of Kyushu and Diamond/Pearl’s Sinnoh has the geography of the Japanese island of Hokkaido and the southern part of the Russian island of Kunashir. This time in the latest installment of the Pokemon franchise we find ourselves traveling to New York under the alias of the Unova region (English name remains unknown at the moment). More specifically the New York Tri-State Area (Am i the only one hoping Dr.Doofenshmirtz & Perry make a cameo..?). The Player’s starting town Kanoko Town is also known to have a harbor and airport tower (with an airport somewhere ofcoarse). In the Anime, Ash, his mom (Delia) and Prof. Oak arrived by airplane, and were greeted by Professor Araragi (the first female Pokemon Professor in the video games, Second in the Anime with Prof. Ivy in the Orange Islands). Soon afterwards, Ash left Kanoko Town to begin his journey in Unova. Pokemon Event for HGSS: Mew!!!!!! A Wi-Fi event to download Mew has been announced for North American HeartGold and SoulSilver games. You can download Mew from October 15 through October 30, 2010. Get this rare pokemon while you can – by the looks of Pokemon Black and White this might be one of your last chances to get it! The remakes to the classics continue in this revisited adventure! Already released in Japan and coming soon to the US! Released on the 10th year anniversary of the original Gold & Silver games in japan and will be presumably released during the US’s 10th year aniversary. This is the one the fans have finally been waiting for! Can’t wait!